Articles From Subject-Matter Experts and Industry Leaders. Leaders read the headlines. They know about the survey data. The linkages between career development and productivity gains, expense reduction, quality improvements, innovation and bottom-line results are obvious. And yet most organizations are still poor at growing talent. Plenty of Room to Grow -- by Beverly Kaye and Lindy Williams, HRO Today, August 2018. (link) Moving up isn’t the only way to achieve successful career development. Career Development's (R)Evolution -- by Beverly Kaye and Lindy Williams, TD Magazine, July 2018. (pdf) From its original role as a method of finding the right job, career development has evolved into a process for professional growth that encompasses the wide range of experiences that ultimately form an individual’s life’s work. Women represent about half of the nation’s workforce yet still make about 83 percent of men’s median wages, according to the U.S. Bureau of Labor Statistics. They’re also underrepresented in the c-suites and boards across nearly every industry. In other words, women are working just as hard but aren’t seeing the full benefit of their efforts. Talent managers should continue to question employees long after the initial interview to help ensure they’re happy and productive. Wise leaders build engagement by becoming magnets for high-performing talent. Why are so many employees packing up and moving on? According to research by Career Systems International, the very thing that is most often compelling them to stay is the one thing well within the power of the organization and its leaders. Employees want opportunities to learn, grow and develop. Crowell and Kaye show how a supportive manager and great boss are the essential ingredients in high engagement. Given the nature of today’s workplace, there are a number of things pulling at business leaders’ attention on any given day. Instantaneous access to information coupled with pressure to consistently meet the ever-escalating expectations of customers and shareholders offers fuel countless priorities and to-dos everyday. But there’s one priority that might serve leaders better than any other and drive sustainable business results: career development. Talk is cheap … or so the saying goes. But when it comes to what matters most to employees today, talk is one of the most valued commodities organizations have to offer and what most employees want from their leaders. Planning a career in today’s business environment requires a different way of thinking. With the speed of change sweeping through business environments, organizations increasingly need to adopt a more flexible mindset that empowers employees for career self-management. If accelerating skill development and building the talent pipeline is important, then this new mindset is critical as well. Weaving career development into work flow makes for an organic and powerful tool for talent managers. But becoming too stealthy risks the effort going unnoticed. 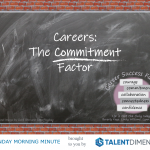 Career development is one of the top engagement and retention driver for all generations. This is even more so for Gen Y and Millenial workers, who are direct about their career plans and eager to try out new and interesting challenges. If employees don’t have career conversations with their managers, then they are likely to do it outside, with headhunters. Individual development plans, or IDPs, have become a staple for managers and human resources professionals alike. But the development activity is often steeped in a systematic approach — forms, deadlines, sign-offs and processes — that ultimately dilutes the value it brings to the individual employee. In a similar vein, the stress of following the IDP process and hitting the associated deadlines often leaves managers overstressed. Successful and satisfied people have one thing in common: PEP, as in personal, energy and professional vision — a clear sense of what one wants to accomplish in life and work. Having talent development conversations cannot be considered an activity. It’s a mindset that permeates a manager’s approach to work. When it comes to the manager’s role in development, talk is the most precious and results-driving commodity you have to share. The idea of holding IDP discussions between managers and direct reports isn’t new. These discussions were once held as part of the performance management process, or separated out. Often these conversations weren’t taken seriously unless they were used to surface high-potential talent or weed out unsatisfactory workers. The process was frequently ignored by most workers-the massive middle. In fact, many managers and employees groan and grumble about the IDP process. Is it that time of the year again? IDP’s can seem like a huge waste of time. Today, more than ever, people are asking their companies, “Can I see my future in your future?” See it, they stay. Don’t? They’re gone. Whether they quit and leave or quit and stay, growth and development is the single, biggest driver of employee engagement. We need to reframe the roles that managers and employees must play to make career development fit within today’s workplace. 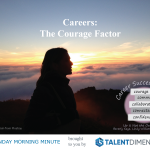 Wendy Tan builds a case that career development is the ultimate productivity booster. Curiosity can be cultivated and developed like any other competency. There are six key practices that promote curious behaviors. Now, more than ever, employees want opportunities to learn, grow and develop. Get stingy with those opportunities and you may see employees leave – physically or psychologically. Business is about getting results, closing sales, bringing in new clients and balancing books. Leaders read the headlines. They know about the survey data. The linkages between career development and productivity gains, expense reduction, quality improvements, innovation, and bottom-line results are obvious. There’s a lot of talk about conversation in business today, and everyone has a favorite type. Some like it fierce; others prefer crucial. An established brand built around continuous learning can be a marketplace differentiator for potential recruits. Career development appears at the top of many lists. Unfortunately, the lists tend to be those focused on what employees desperately want but are not getting from their managers. Experts say that bosses must help employees climb the corporate ladder or face losing their best and brightest assets. A lot of what makes work engaging and doable for people who have lives outside of work comes down to good communication. This article highlights Beverly Kaye’s keynote at the Working Mother Work Life Congress. Managers and supervisors everywhere are declaring career development a casualty of today’s business and economic landscape. How reframing career-development talks can help you retain your best employees and help them succeed. Up isn’t the only way to go if you’re seeking to advance your career. Lateral, or even downward, moves can be just as beneficial to achieving your career goals. For years we’ve heard that “talk is cheap.” Not true. When it comes to the manager’s role in development, talk is actually the most precious and results-driving commodity you have to share. Even in this sluggish job market, your best people always have other offers. Here’s how to entice them to stick around. Assuming a management role in today’s workplace comes with a front-row seat to some of the greatest business challenges of our time. On a daily basis, managers are tasked with several myths. Learn about the myths and how to overcome them. A global healthcare solutions firm learns that career development does not equate a vertical climb. To leverage the power of busy managers, ensure they are prepared to accept their roles as employee development partners. There are distinct differences in the why’s and how’s of developing each of the four generations, since each has a distinct attitude and approach to careers. The complex interplay of social, economic, technological, and legal developments that have appeared during the past few decades have radically disrupted this long-standing pattern. One of the strongest messages for today’s workforce is the necessity for self-accountability for one’s own career. Employee engagement. What is it? Where do you start? And how do you go from a place where you are managing attrition to attrition managing you? EY, a global professional services organization of member firms with more than 200,000 employees and operating in more than 150 countries, faced a problem common in the professional services industry: attrition. In past years, attrition of personnel from the assurance practice of the U.S. firm’s central region started to trend upward. Today, the U.S. firm is seeing a decrease overall and, at some levels, more than a 10 percent decrease. What happened? Did people just stop leaving? Just how energetic are you today? Enthusiastic about life and work? Feeling happy, satisfied and full of promise? Or, is the opposite true? A little lethargic, sluggish or lifeless? Careers and life are never static. They languish when we lose focus, lack plans, become bored and forget to live in the present. It happens when we lose Personal, Energy and Professional vision (PEP)- not just the feeling. And, when we lose PEP, our guests lose too. Guest satisfaction is directly tied to just how engaged we are in the hospitality industry. If we want to engage our guests, we have to engage the “hearts and minds” of everyone they encounter during a stay. The hospitality field for HR professionals is being slammed with the need to replace an aging workforce, find and develop talent among significantly different generations of workers, create career paths to grow the next generation of leaders, plus measure and manage budgets that must be justified for recruitment and retention. Getting these tasks done-tasks that will result in a vibrant, resilient organization–seems overwhelming. Yet, it is often the elegant, simple approach to keeping and attracting talent that wins the day. When managers look at their older workers, do they see gray or gold? Do they view them as over the hill, burned out, obsolete or change-resistant? Or do they see them as committed, wise and mature sources of leadership, intellectual capital and organizational history? HRE talks with Beverly Kaye about her upcoming book, Hello Stay Interviews, Goodbye Talent Loss. Stay interviews with current employees yield more helpful retention insight for organizations than exit interviews currently do. Beverly Kaye shares three key strategies that build loyal, productive employees. Employee fit is arguably the essence of employee engagement. But what happens when fit isn’t immediately clear? By the time exit interviews take place, employees have made up their minds, and seldom do they reverse their decisions. It’s simply too late. Luckily, the alternative doesn’t require a major shift in thinking. Instead, it takes a switch in when during the employee life cycle a similar, but arguably more effective, conversation takes place. Strategies for keeping talented agents that won’t strain the call center budget. Call Center leaders want their talent to stay. And not just stay, but be satisfied, engaged, and highly productive. Call Center professionals, at all levels (agents as well as team leaders), want just a little more – of something. Team leaders and employees alike can get more of what they want by remembering to Ask. Curiosity may be a natural friend to diversity. It opens the door to different points of view, facilitates insights and understanding, invites involvement and inspires greater engagement. Webster’s Dictionary describes a game plan as a “plan for achieving something.” Inside organizations, achievement is measured by business results. These results are delivered by people – people who are either engaged and motivated or disengaged and unproductive. To harness and optimize the talents of every player on their team, leaders at all levels need a game plan. Your risk of losing talent is highest in their first three to six months on the job. Why might that be? Too often we choose the right people but fail to support them as they assume their new roles. It is crucial that you extend the handshake in ways that matter to each new hire. When employees across the country answered the question, “What kept you?”, no group had “dollars” in the top five reasons. So, money alone will not guarantee that talented employees will stay. What else can HR professionals do to help keep these employees? Kevin Kruse talks to Beverly Kaye about the importance of managers in positively or negatively impacting employee engagement and retention. Why Employee Morale Matters – by Lynn Cowart, The Public Manager, Spring 2014 (pdf) The solution to engagement and retention issues is the ability of the manager to truly understand what is in the hearts and minds of their employees. The right dialogue can motivate employees to stick around and not just be part of the change, but help drive it. Chapter from the recently updated 5th edition of Love ‘Em or Lose ‘Em: Getting Good People to Stay. Being outside the predominant group can be difficult, and the challenges minority employees face often contribute to high turnover rates. But there are serveral cost-effective tactics talent leaders can use to help keep diverse workers. Many factors are working against employee engagement in Asia, but there are ways to change that momentum. This article will provide insight into how. Technology has been a boon to productivity, but it hasn’t contributed as much to relationships between managers and direct reports. There is a simple way to circumvent that: talk. When used well, task forces generate buy-in and provide a direct line to employees’ voices, but to ensure success learning leaders should consider the critical components of team engagement. A fun-filled workplace builds enthusiasm, which leads to increased productivity, better service, positive attitudes, and talent loyalty and longevity. One of the toughest challenges contact centers face is agent turnover. Whether the cause is burnout, dissatisfaction with opportunities, the boss or the pay, well-trained people are leaving contact centers faster than they can be replaced. You and your fellow employees have likely complained about your boss many times. You said you would never have done it that way, or you felt you deserved credit or appreciation and it just never came. Effective coaching can happen virtually if managers maintain a development focus and work to create a continuous connection. By learning to identify what’s beneath five common employee complaints, managers can turn whines into wins. For more than a decade, leading human resource strategists have hit on a recurring theme: You want your star players working in the roles that matter most to the business. We have identified six leverage roles where you want to make sure you have — and keep — your highest-caliber people. Read this January 2018 article in the Harvard Business Review to learn more about these roles. Targeting Your Retention Strategy by Beverly Kaye, Cile Johnson and Lynn Cowart, Human Resource Excellence, December 2017. Many CHROs are rigorously determining which positions give their companies a competitive edge. Their next step should be modifying what they’re doing to hold on to the top performers who fill those key roles. Read this Dec 2017 Career Systems Intl article featured in Human Resource Excellence magazine for our insight. What are the key talent issues businesses can’t ignore in 2018? The right roles, the right people and the right retention strategies. The Institute for Corporate Productivity (i4cp) recently asked us along with 12 other HR thought leaders and industry experts: What must HR do in 2018 to stay ahead of the curve? Read our predictions for 2018 and the implications for HR here.